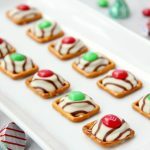 Pretzel M&M Hugs- Sweet and salty three-ingredient bite-sized treats perfect for Christmas and the holidays! It’s Christmas candy making time! Or at least, it will be soon.? I’ve been testing recipes in the kitchen lately, and plan to share some of my favorites here on the blog in the next few weeks. 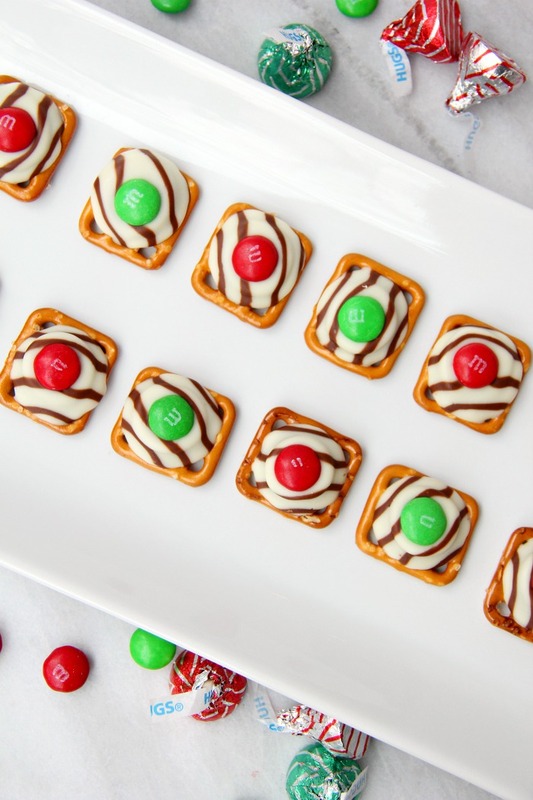 Today, I’m sharing a recipe for Pretzel M&M Hugs. These treats are classic. 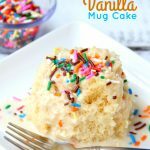 They’re simple to make and come together with only three ingredients! I don’t know about you, but during the holidays, I have a pretty long to-do list. While cookie and candy making is on the list, I never look for long, complicated recipes. 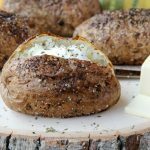 I need something quick, easy and delicious. 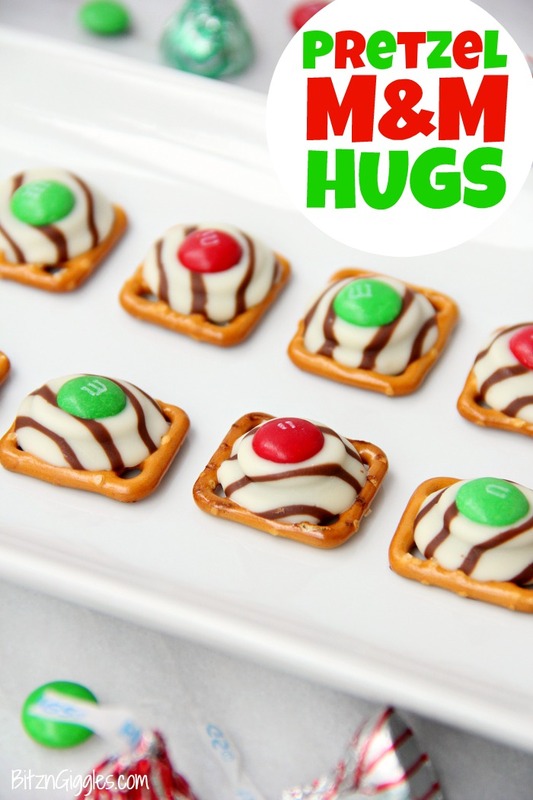 These Pretzel M&M Hugs fit the bill for sure! Ready for this? You probably don’t even need to write this down. You need pretzels, M&Ms and Hershey’s Hugs. That’s it? That’s it. I like using square-shaped pretzels because they look nice and provide good support for the Hugs you’re going to melt on top of them. 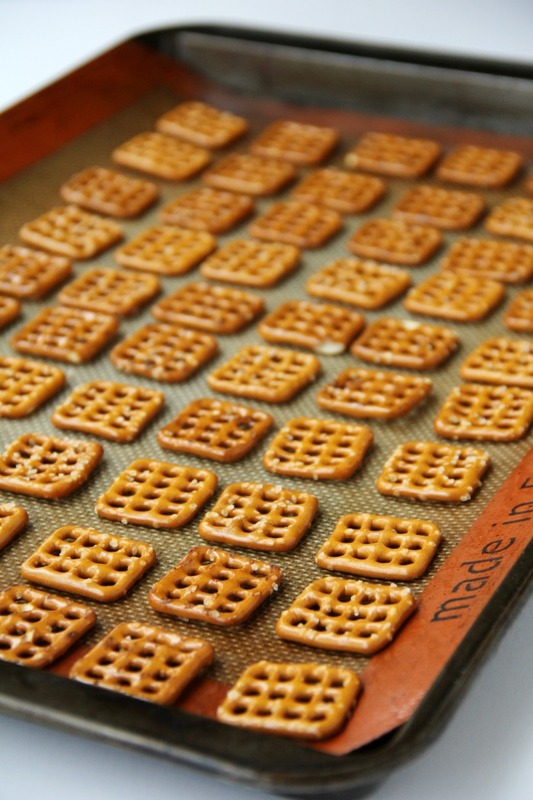 You begin by lining your baking pan with pretzels. Next, you take unwrapped Hugs and place one on top of each of the pretzels. After you place them in the preheated oven for about 4-5 minutes, the Hugs will turn “glossy.” Pull the pan out of the oven and gently press an M&M into each of the Hugs, flattening them a bit. Allow them to cool. I usually place mine in the fridge, but if I’m making multiple pans worth, I’ve been known to cool them on a shelf in the garage and even outside on our deck. That’s a nice benefit of a cold, Wisconsin winter, I guess! These tasty and addictive treats can be made up to a week ahead of time and are perfect for gift giving. 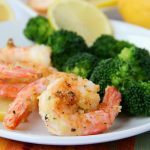 Keep them in the refrigerator in a covered bowl until you are ready to serve them. 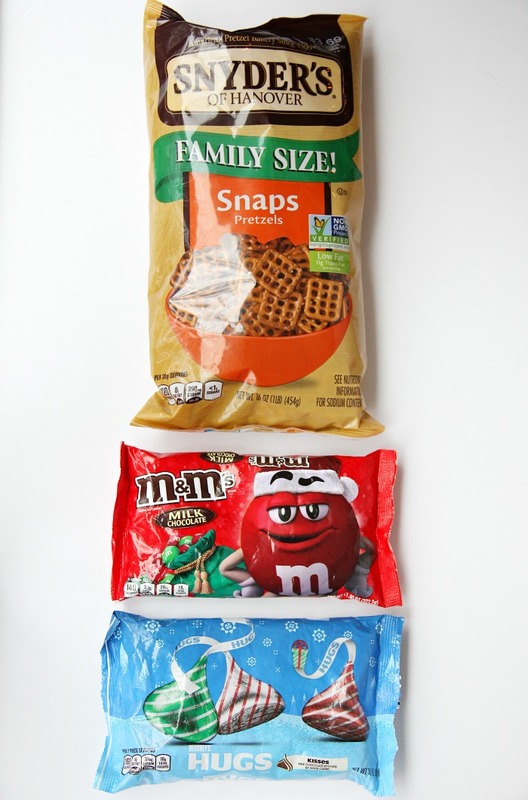 Next time you’re at the store, grab the ingredients for these Pretzel M&M Hugs. 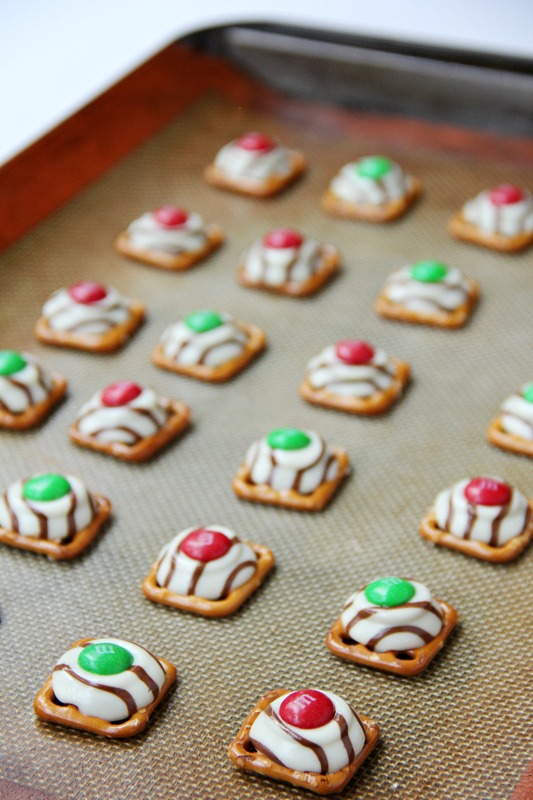 Kids love to help assemble these treats as well so take full advantage of their help! You’ll have a bowl full of these sweet little bites in no time at all. Hungry for More Christmas Favorites? 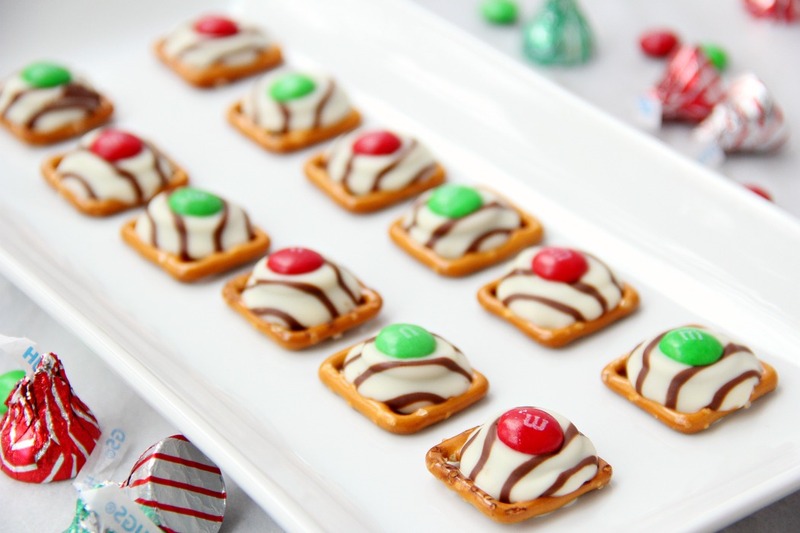 Sweet and salty three-ingredient bite-sized treats perfect for Christmas and the holidays! Preheat oven to 200º Fahrenheit. 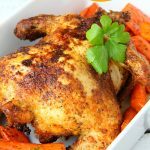 Line a baking pan with a silicone baking mat or parchment paper. 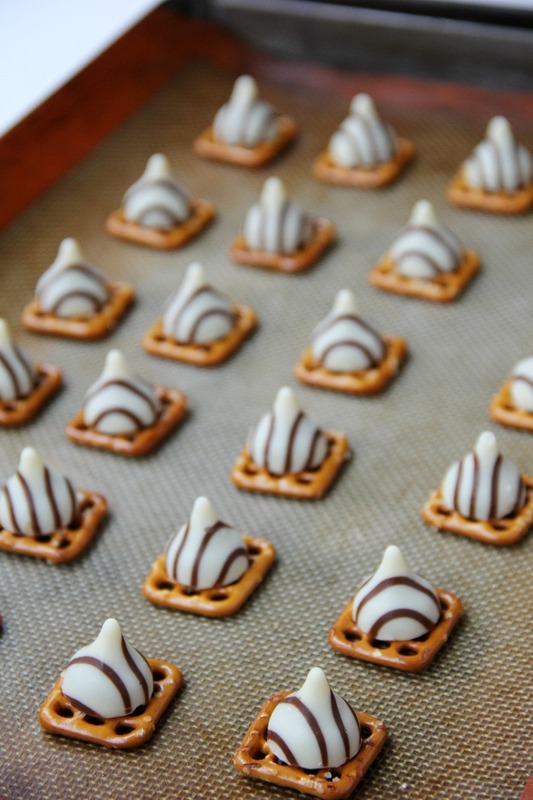 Arrange pretzels on the sheet. Place a Hershey’s Hug on each of the pretzels. Heat in oven for 4-5 minutes (they’ll have a “glossy” look). Press an M&M down onto each Hug, flattening them out. Place the tray in the refrigerator to cool for about 10-15 minutes. Store in a covered bowl in the refrigerator.